#OHL Eastern Conference Semi Finals - @OHLBarrieColts vs @OHLBattalion Schedule. - Very Barrie Colts | A website covering the Barrie Colts of the OHL. 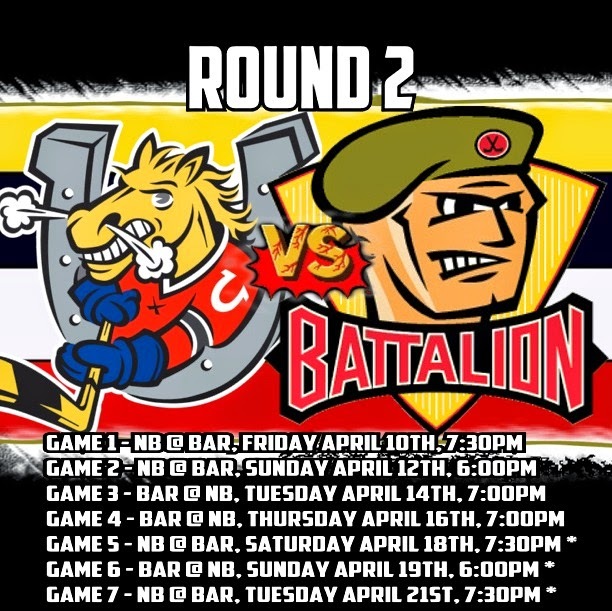 Home Barrie Colts blog North Bay Battalion OHL Playoffs Round 2 #OHL Eastern Conference Semi Finals - @OHLBarrieColts vs @OHLBattalion Schedule. #OHL Eastern Conference Semi Finals - @OHLBarrieColts vs @OHLBattalion Schedule. The Colts continue their playoff run this Friday when the Eastern Conference Semi Final series begins against the North Bay Battalion. This season these teams faced 6 times and both teams won 3 games each. We will have a complete series preview this week. Here is what the schedule looks like. Tickets for game 1 and 2 are available at www.ticketbreak.com or you can pick them up at the Barrie Molson Centre at the Colts Store.